It seems my first prediction of the year came true: There won’t be any massive “Tea Party” rallies. Instead… more impromptu displays celebrating American principles and liberties will occur. 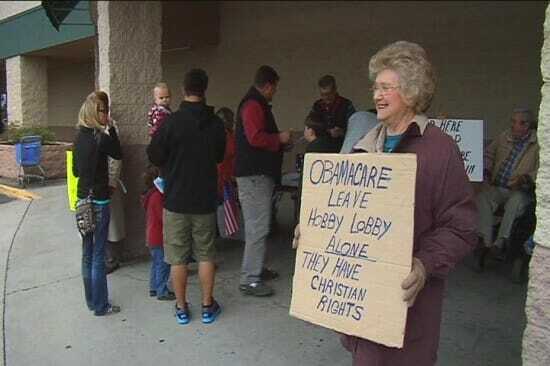 Over 60,000 people signed up to shop at Hobby Lobby Saturday in a show of support for the company’s freedom of religion. The firm sells arts and crafts supplies and is owned by evangelical David Green. The company filed a lawsuit against the Health and Human Services contraceptive mandate that requires it to cover contraception, sterilization and abortifacients in their employees’ health care. In Colorado Springs they took it a step further and showed their appreciation for the store outside of building with signs and songs. Hobby Lobby’s owner, David Green, says he’s against President Obama’s healthcare mandate which forces companies to cover things like contraception. Those in the crowd today say they’re supporting Green because he’s standing up for his religious freedom. 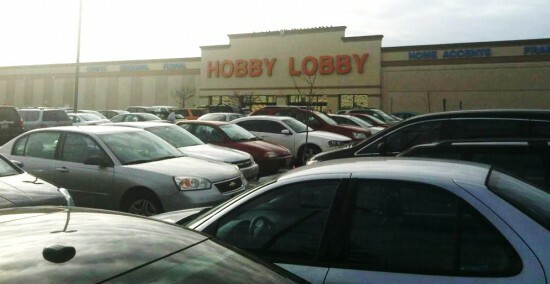 The parking lot at Hobby Lobby in west St. Louis was packed today. Inside the west St. Louis location the workers said, “It was like Christmas” and that business was booming today. I have an admission to make: I view arts and crafts stores with the same sort of unease that a vampire would view a garlic stand. Additionally, the nearest Hobby Lobby is 50 miles away. However, Tammy Bruce’s tweet inspired me to engage in one of my favorite hobbies — online shopping. As I am a relatively recent Catholic convert, I have been wanting to “Catholic up” my home, so Rust Cast Iron Layered Cross from the Home Decor menu seemed like a good bargain. PROTEST BONUS! There is a petition on the White House website to officially recognize the Roman Catholic Church as a hate group. Happily, they seem rather shy of the 25,000 signatures requested. My purchase seems like a good way to protest that, too. We aren’t even done with the first week in January, and tens of thousands of Americans are already purchase protesting! I suspect it is going to be a very long year for the elite media and establishment politicos. What the Tea Party needs is a 5 million man/woman/child walk on Washington. Do it every year until politicians stop patting us on the head as if we are petulant children. If David Gregory is not formally charged for violating DC’s absurd gun laws, I hope someone will organize a pro-Second Amendment rally. Get a million or two million people to show up in DC carrying empty 30 round magazines (no guns) and peacefully march around in front of NBC’s studio. Just a note Leslie: I am very excited about all of your recent Tea Party posts. They have and will provide more and more traction for the Tea Party. Sally: Thank you so much for the kind remark. It has been a privilege to share some of the stories from my compatriots, and I am hoping I have more, better news to offer over the next year. This may provide a “feel good” atmosphere but the fact remains that most of the sheeple still get their news through the MSM which will hardly give provide coverage. I bought 5 crosses on their online store. I thought that was a fitting use. I’m always looking to add to the cross wall. Welcome to Catholicism. I hadn’t signed up, but I went to Hobby Lobby yesterday nonetheless. I’d made the trip up near where one is located to attend a gun show and then went to Hobby Lobby, too–a double bonus. Please- can’t we just have a few states cede from the union and leave the sodomites supporting the Obama white house and congress to their own devices? What does it even mean to “officially recognize the Roman Catholic Church as a hate group”? Exactly who is supposed to do this “official recognition”? Since when is there any such thing in the first place? Do these people imagine that somewhere in the federal bureaucracy there’s some sort of Registrar of Hate Groups, to whom such a petition would be forwarded if it were to get 25K, or 250K, or 2.5M signatures? Let’s start a petition that the AFL/CIO, SEIU, and each and every other union (I can’t list all the alphabet soup here!) is a hate group! Same objection: What exactly would these people be petitioning the President to do? There is no such thing as a Register of Hate Groups. There is no such thing as “official recognition” of “hate groups”, any more than there’s official recognition of “love groups” or “funny groups” or “nerdy groups”. So there’s nothing to petition for. Leslie, welcome Home and God bless and never forget that “they” hated Jesus first. Peace.